Bounty Hunter Tracker II Metal Detector is one of Bounty Hunter's intermediate metal detectors, but with a completely redesigned graphics package and electronics for the best features and performance. It features a large, analog sensitivity meter and knobs to adjust the sensitivity and discrimination of the machine. Two audio tones will alert you to the different types of metal buried underground and a bright LED light will make sure you know when the batteries are running low. 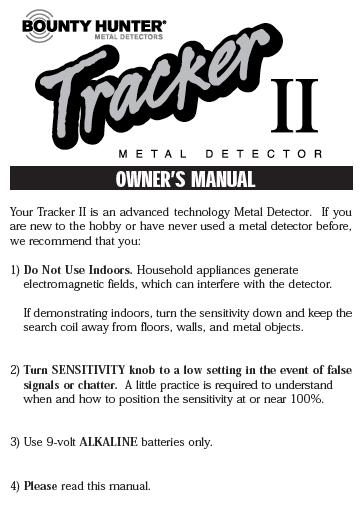 The Bounty Hunter Tracker II is the most basic and classic metal detector on the market today. If your favorite youngster has treasure hunting aspirations - this lightweight machine is the one to get them started! Bounty Hunter Tracker II combines the ease of automatic ground balancing with manual settings for some of the most challenging types of soil. Whether sifting through the sandy beaches for lost items or searching for silver, this model can do it all. Download the owner's manual here.